It’s day three of Great British Beef Week 2019 and we’re still savouring the incredible piece of beef we enjoyed on Mother’s Day. A key piece of getting a high quality cut of beef is to choose assured and talk to your butcher, as we discussed in our previous blog. So we thought we’d let you in on our secret. On Budleigh Salterton High Street you can find local family business, Brian Sampson’s Butchers. Brian just happens to be an approved supplier of Quality Standard Mark Beef, and a man with a real passion for provenance. He cut us a rolled rib from a side of beef he had hanging in his fridge which came from a local Longhorn herd. Mrs. Otter Vale and Brian got chatting, and well, as it’s Great British Beef Week, we should tell you some beef about our local butcher! Brian is Budleigh born and bred. He remembers spending most of the summers on the beach, part of the fabled Jurassic Coast. Being a Budleigh boy, he can remember Otter Vale from way back. Great-grandpa Otter Vale started the Laxon family off in the food business 50 years ago just off the High Street. One of Brian’s best friends lived very near to the fish and chip shop on the corner of Perriam’s Place, where great-grandpa bought our original little kitchen in 1972. 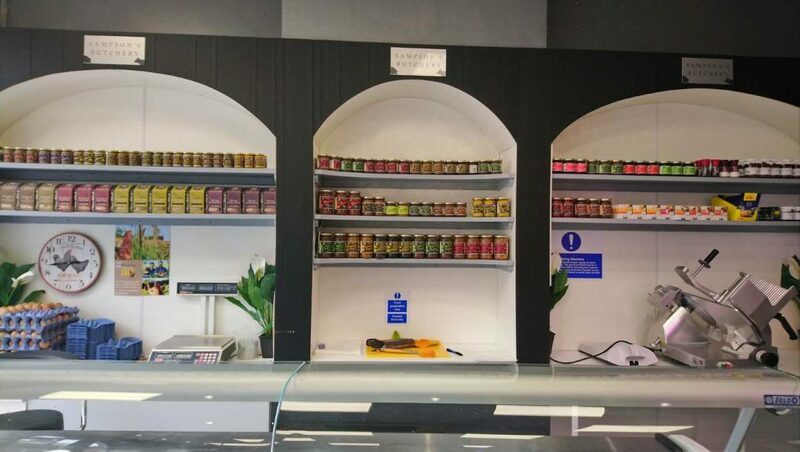 Sampson’s Butchers opened in November 2018, but Brian’s been in the trade for a lot longer than that. 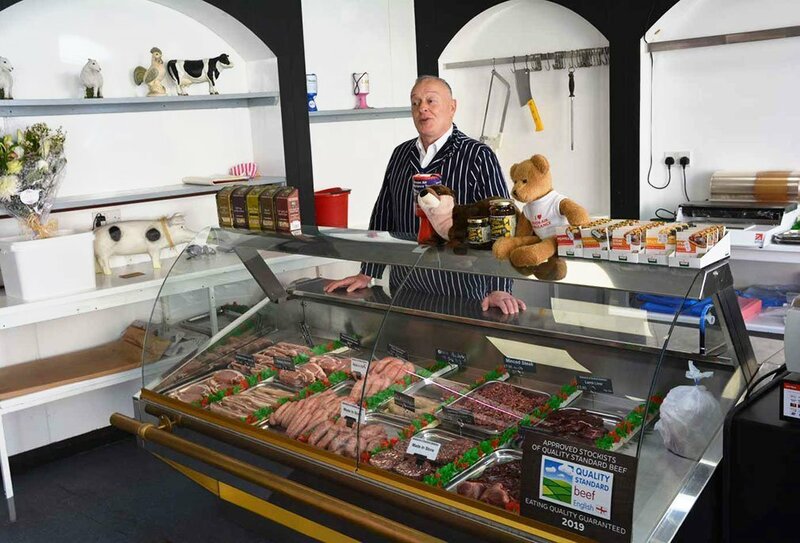 It’s a fitting site for him – Budleigh High Street is where he started out as a butcher’s Saturday boy back in the 1970s, and within two years he was a butchery manager. Now he is head of a team of five, including his wife Wendy, sister Lana, Debs and Phil the butcher. 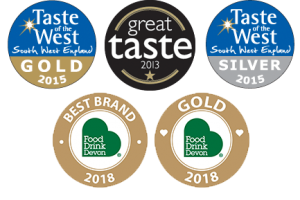 Recently we’ve been taking a closer look at the history of the town, given that we are celebrating 40 years of Devon Chutney. Our family has certainly seen some changes in that time, and we asked Brian what changes stood out. He said, “Back in the 1970s we had three butchers, two bakers and a fishmongers. 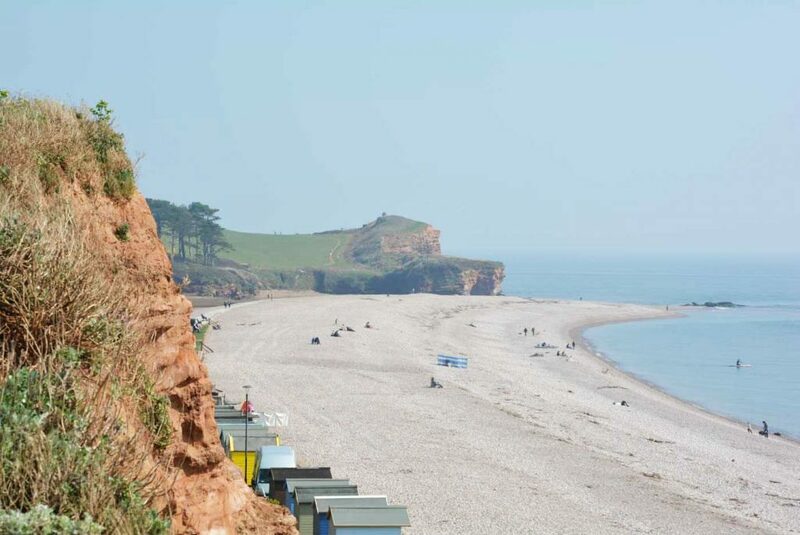 One brother worked as a baker in the High Street with my sister, and the other brother worked in the fishmongers.” It’s sad to see the effect of changing eras on any high street, but heartening to know that Budleigh still supports a local butcher, and that the shop has so many family members involved. I find it hard to let go of old habits, and when I first met Brian the old vet head kicked into gear, and we were soon chatting away about provenance, welfare and quality. He reeled off names of farms, farmers, breeds used and distances from his shop, and it was such a pleasure to talk to a man so clearly passionately about what he does and how he does it. I asked him why he felt provenance and providing local meat was so important. Brian explained, “I enjoy dealing with local farmers. I find you get a higher quality product along with a higher knowledge and great pride in what they produce.” The beef that we cooked on Sunday was certainly testament to that! A bit more then about Brian’s suppliers. He said, “My beef comes from Peter Grabham’s family in Halberton Village where they have been farming since 1871.” That’s about 3 miles as the crow flies from Otter Vale HQ! The Grabhams feed the cattle on grass through the summer, and produce their own winter forage, a sustainable system which affords full control on traceability too. Brian continued, “My lamb is also local, free-range and grass-fed, from Chris and Hollie at Beech Ridge Farm, Wellington. Pork comes from Tremlett Farm’s Wessex pork, originating from Wessex Saddleback crosses, grazing on the pastures west of Wellington”. This herd is bred and reared on the farm, weaned onto straw yards in family groups, and grazing year round. I asked Brian what quality assurance scheme offered to him as a butcher. He told me, “I always look for the absolute best quality regardless of price, and the quality assurance schemes help me with my choices”. I also wondered if he knew what his customers made of them and he was confident that his customers were very keen to know the provenance of his meat, and the history of the breeds and the farmers that supply the shop. It stands to reason that customers who use a butcher will be interested in provenance, but it’s nice to hear it from the butcher’s perspective! Keen to know how Brian felt we could help customers who are on a very tight budget to support local butchers and farmers, I found his reply very encouraging. He told me, “Try to buy less if on a tight budget, but when able to, come in. We will always help however little or often you shop with us”. I had to ask Brian about his favourite breed of cattle for meat quality and flavour, and why. He didn’t hesitate at all, “Longhorn beef. This is the Great British beef. The beef is the best I have ever tasted. I am told this each week from my customers!! 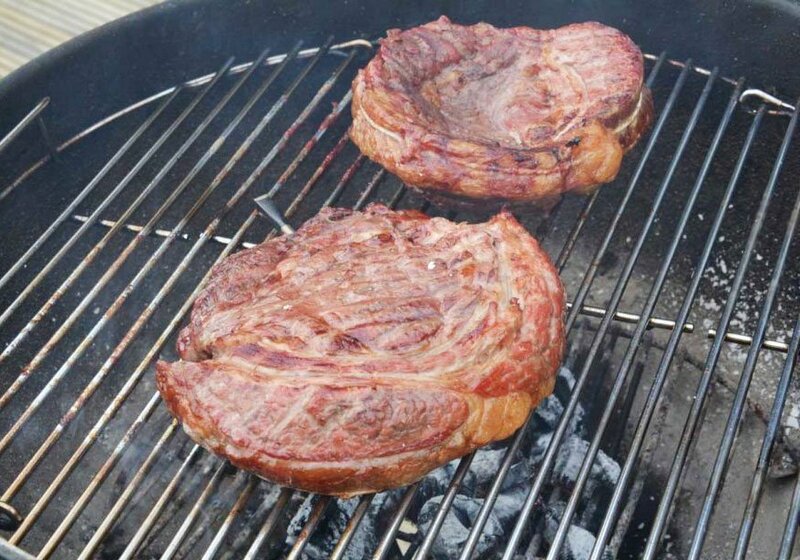 Heston Blumenthal uses it in his recipes and advocates it as the best beef ever”. Well, if it’s good enough for Heston… And there I was thinking it was all down to Mr. Otter Vale’s amazing cooking skills! Ha! In the interest of full disclosure though, Ben did have a little help from the incredible Marcus Bawdon of Country Wood Smoke – thank you Marcus! Longhorn meat with its marbling enjoys a fantastic reputation (it’s been crowned Best Beef in Britain by Countryfile! ), and after the meal we had on Sunday, I can’t question that. 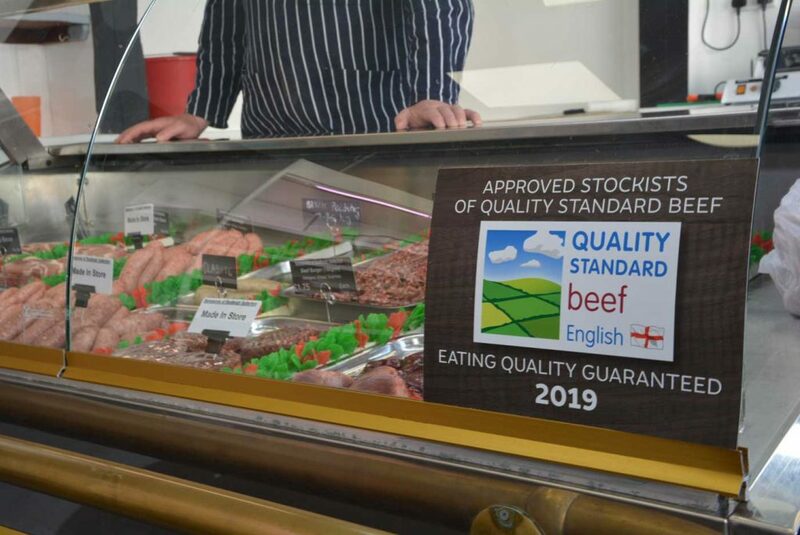 Watton Farm meat is hung for a minimum over 3 weeks (ours was reportedly dried for over 40 days), and all we can say is, quality speaks for itself. Given that Mr. Otter Vale does 99% of the cooking in our home, I asked Brian a few more essential questions: what’s your favourite beef dish, and who’s the best cook in your family? He was kind enough to indulge me. It’s roast rib of beef, and it’s his wife Wendy who cooks a fantastic roast – but don’t tell Mr. Otter Vale or he’ll want a wife like that! Brian Sampson’s Butchers, Budleigh. The Otter Vale range! Hello, Are you open on Saturday’s including Easter Saturday? I’d like to order an organic & free range Chicken-to pick up on Saturday if you are open? Hello there, we’re not actually the butchers, although we can tell you that they do open until around 3.30pm on Saturdays. Best give them a call on 01395 442824 to check Easter Saturday and ordering. Thank you.